But because I love broccoli salad so much, I figured that there had to be a way to lighten it up without losing it’s incredible flavors. And with such a healthy ingredient as the star of this salad, it seems only fair that it be topped with an equally nutritious dressing. By subbing out the mayonnaise with plain, nonfat Greek yogurt, you still get the creamy base without all the unhealthy fat and calories of mayonnaise. Plus, it kicks up the protein a notch too! Then, I used honey instead of sugar. And I used a lot less, while still making sure that it was sweet enough to balance the tang. It turned out pretty amazing. I served this over Labor Day at a BBQ, and it was a hit. Loved by all who tried it. 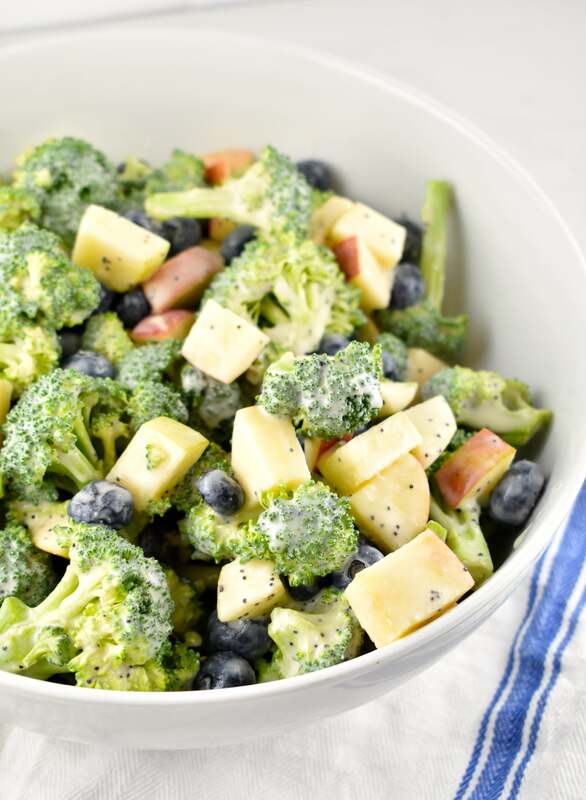 The combination of the crisp broccoli, tart blueberries, and sweet apples, all tossed in a light, moderately sweet, and creamy dressing, makes it a perfect summer side dish. It’s an incredibly easy salad to make too. Because I use a bag of broccoli florets, the only thing that really needs chopping is the apples. (Yay for less prep!) So it comes together in just minutes. 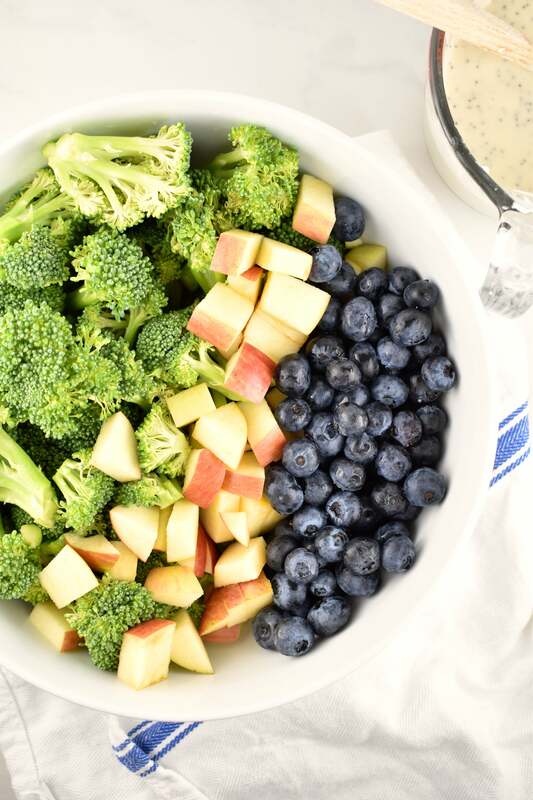 PRO TIP: If you are aren’t a fan of the taste or texture of raw broccoli, just blanch or lightly steam the broccoli for a minute or two enough so that it remains crisp, but loses that raw taste. But make sure to pat the broccoli dry with some paper towels so that the wet broccoli doesn’t dilute the dressing. 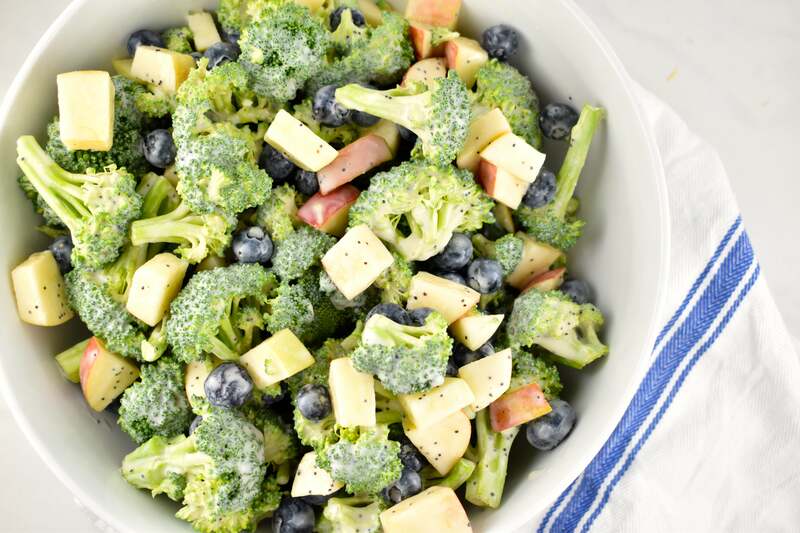 My Light Broccoli Salad has easily become a summertime favorite around here. It goes really well served alongside just about any meat or fish entree. 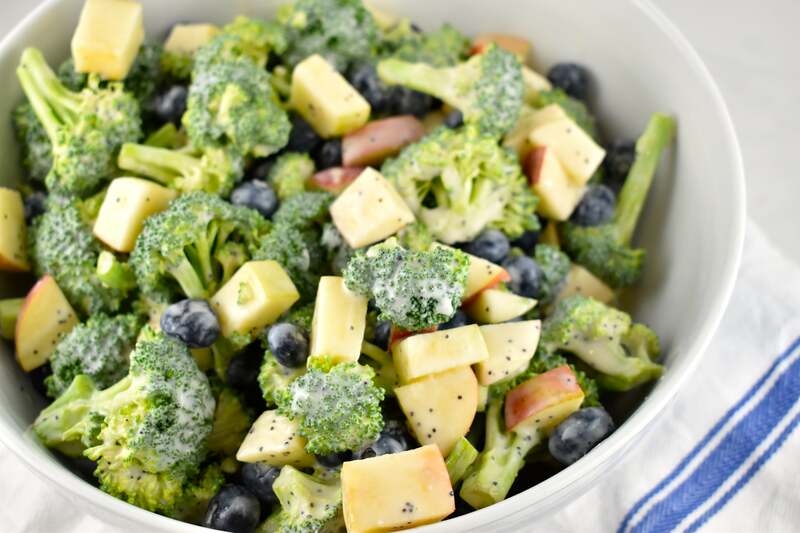 And this delicious and healthy salad will be a hit at summer potlucks and parties. Enjoy! 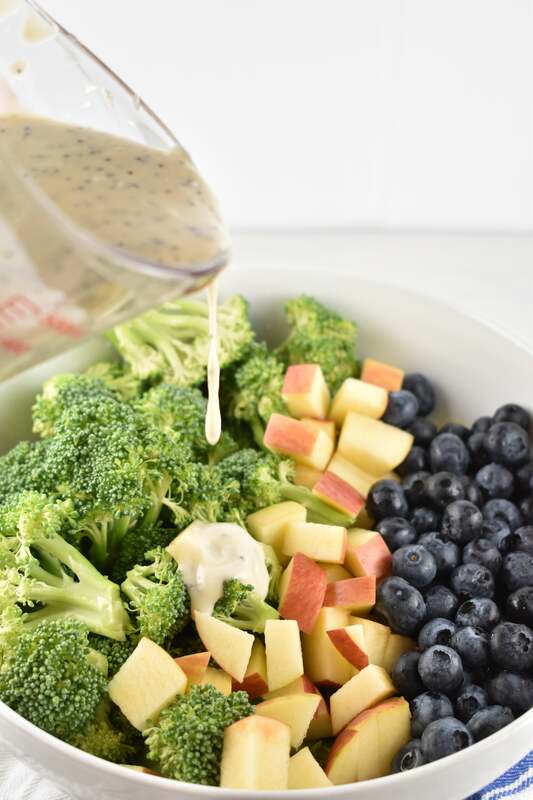 A lightened up, healthier version that offers a delicious crunch from the crisp broccoli and apples, all coated with a sweet and tangy yogurt poppyseed dressing. In a small bowl, whisk together the yogurt, lemon juice, honey, vinegar, vanilla extract, and poppy seeds. 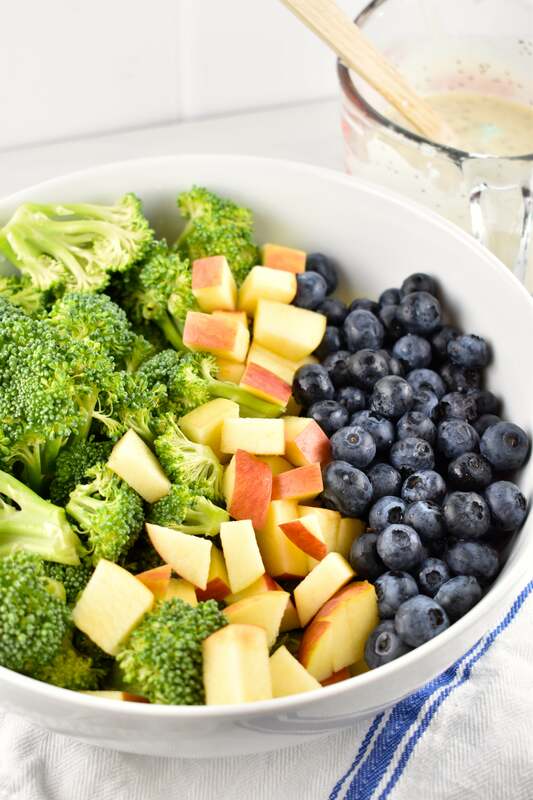 Toss together the broccoli, blueberries, and apples in a large bowl. Pour dressing over top, and toss to coat.